This tour allows you to discover the Peterhof Palace complex indepth. You will visit the Grand Palace, the Lower Park with it’s beautiful fountains, and also three small palaces, located on the territory of the park – all different and all unique. 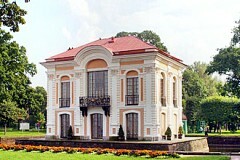 The complex was built by the order of Peter the Great, to be the official summer residence of the Romanov’s family. The picturesque Lower park counts 114 various fountains ans 3 large cascades. Peterhof is usually compared by it’s beauty and luxury to the Versailes Palace in France. The small palaces are built in different styles – Monplaisir holds the touch of Holland houses of this epoch, Hermitage is a true baroque creation. Tour duration – 7 hrs.